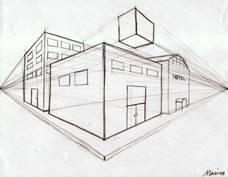 In drawing, perspective is the art of drawing solid objects on a two-dimensional surface so as to give the right impression of height, width, depth, and position to each other when viewed from a particular point. As an example, how might you view this statement, “Television corrupts children’s minds?” Some might think, “Too much television corrupts children’s mind,” while another thinks, “All televison, in any form, is as an evil media.” It is all a matter of individual perspective. As believers, we too have our views. We have an attitude or view toward something or someone in the world, in the social or political arenas. Even with the Bible we have varying views and outlooks. Some may worship God without musical instruments while considering other believers to be in error for using musical instruments or clapping hands, calling them sacrilegious. It is a matter of perspective. It is a matter of the heart, not the head (the lust of the flesh). The subject of this writing is not “worship” but perspective… correct perspective, God’s perspective. We must learn to look through the eyes of God our Father, not the eyes of our own understanding. What we may see as unholy or ugly, Father God may view from a different perspective. All the while, we have been speaking against the Father by voicing our personal thoughts on the matter. James 3:8-10 But no man can tame the tongue. It is an unruly evil, full of deadly poison. With it we bless our God and Father, and with it we curse men, who have been made in the similitude of God. Out of the same mouth proceed blessing and cursing. My brethren, these things ought not to be so. Having our personal view is how God made us. We are made in the image of God as creative, thinking, and speaking beings. However, corruption was found in the garden and by one man’s sin many became corrupted. But by one man and His sacrifice we have been set free. We are delivered from the curse of the law and have been adopted back into the Kingdom of God as sons of God. Now we are to be and act as the sons and daughters of the Most High.